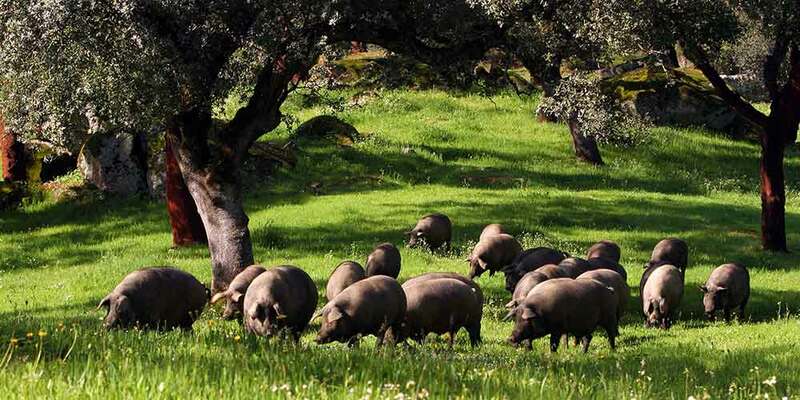 They are fed a diet consisting almost exclusively of acorns (bellota) and the grass of the dehesa countryside, where they roam free until reaching optimum weight. Bellota ham is set apart by its high levels of mono-unsaturated fat which gives the ham a unique nutty flavor and heart-healthy characteristics. In order to ensure that each pig has an ample supply of acorns, they are usually kept to a very low density in the fields, usually over 1 acre per pig. Bellota hams are dry-cured for at least 24 months and sometimes for up to 5 years. This free-range lifestyle, exceptional diet and extended curing are essential ingredients in what makes Jamon Iberico de Bellota the world's finest ham. Pigs with this classification are fed a diet of cereals, acorns and grasses. They roam freely in the dehesa fields. They are cured for at least 24 months. Pigs with this classification are fed a diet of cereals, acorns and grasses. They are farmed in a barnyard, which is the principal difference to the "campo" or countryside pigs. In addition to these three denominations, an additional classification of "100% Iberico" or "Iberico" is used to indicate the animal's heritage. In the case of crossbred pigs, the percentage of Iberico blood must be specified.